As it goes with a lot of my prototypes, this one started with the simple interaction of plucking a petal off a flower. It's an intentionally small action that forces me to explore and develop the "feel" more than the features surrounding it. One can never use enough polishing practice! Because the petals overlap each other, the input needed to be more involved than simply using Unity's Event System. Filtering is essential in such close quarters! For this, I covered the screen in a simple input catcher, which forwarded the touch to a more specific sphere caster. With this I could make the input "sticky", where petals keep the touch until it leaves the collision volume. This prevents the touches from feeling too erratic on edges, where they flip back and forth between two petals. I also played around with adjusting the size of the collisions the further back the petals resided, since it's much more difficult to reach these petals. Overall I'm happy with the input, though I'd probably make them more responsive to quick swipes. From there I just needed a game to wrap it in! Especially since the whole "Loves Me Not" game boils down into odd or even, which isn't terribly fun. 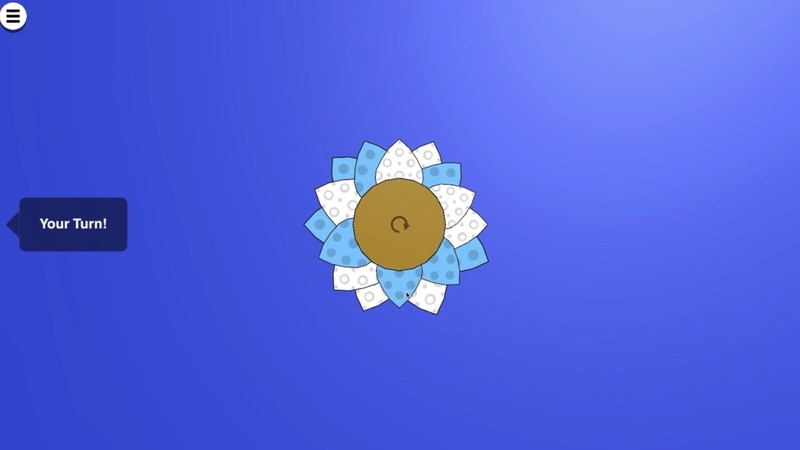 I eventually landed on giving the petals unique rules, with players having to deduce which petal uses which rule. Though it sounds straightforward enough, the rules logic and presentation went through several simplification rounds. At first I though the rules should be hidden, but it made the game all work and no fun. It felt like a natural next step to make it multiplayer as well. Here, players are able to learn from each other's mistakes, as they try to outsmart their opponent using the rules. I took a sledgehammer to the feedback by making the whole background change colors, and having bubbles appear on the player's side.